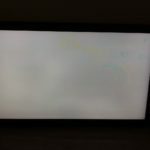 Most of the problems reported with this model of TV is failure of the AS15F chip on the Tcon board which causes a white washed image, solarization or color issues. Fourteen blinks was a possible tcon failure but I couldn’t verify with any manuals online. Checking the fuse on the tcon board showed it was fine but when I measured the voltage, it was only measuring 1.9VDC when I was expecting 12V. This supply is passed through pins 47-50 of the LVDS connector. I was able to find a service manual online. It didn’t contain the diagnostic codes but there was a schematic of the main board. 12V is generated from the power supply board and sent to pin 7 of CN1401 on main board (REG12V). The signal passes through a FET switch (Q1423) and fuse (F1422) and sent to the Tcon board through the LVDS cable. Checking F1422 (24V, 5A, 0402), it was open and I replaced it with Digikey part P121391CT-ND (32V, 5A, 0402). F1422 can be found on the back side of the board almost directly opposite the LVDS connector and to the left on the edge. With the fuse replaced, 12V was present on the Tcon board and the TV started up. However, the screen was whitewashed so I have to replace the AS15F chip as well. Update: After a couple of months, I got my AS15F chips in the mail from China and was able to replace them on the tcon board.